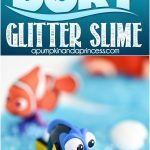 Finding Dory Glitter Slime - create this easy glitter slime recipe as a Finding Dory party favor or summer boredom-buster idea for kids! Empty glitter glue into a medium size bowl. Stir in 1 tablespoon warm water into your glue. In a small cup combine 1 cup warm water and 1 teaspoon borax; stir until borax dissolves. Pour borax water into your glue mixture. Stir for about 10-20 seconds until slime begins to form. Remove from bowl and continue to work slime with your hands. If the slime is too sticky quickly dip the slime back into your water bowl. The borax will help stiffen up the slime, but be careful not to leave it in for too long. Place in a airtight container or bag when not in use.